The best of the best from resort 2015 to get you inspired for warmer days ahead. The resort collections for the 2015 season have been released a while ago, but now it’s time for them to enter the spotlight and to get a well-deserved place in our wardrobes and lives. Because they are destined to be worn in climates where the sun always shines, resort collections are usually relaxed, rich and raw. The 2015 resort collections did not make an exception: from Bottega Veneta to Phillip Plein, and from Armani to Gucci, the creative directors of various fashion houses unleashed their imagination and offered amazing clothes for the 2015 warm season. The main trending elements were the nautical and the military aesthetics. Blue and red were trending colors, and strong, solid materials were to be seen as trending fabrics. Tomas Maier, Bottega Veneta’s creative director imagined a collection that played with soft pastels, tie dye effects and soft fabrics. The designs, which blended sportswear references with a very sharp tailoring, were more casual-oriented and conveyed a sense of relaxed everyday elegance and luxury. This pink look is innovative, outstanding and very soft. It can be worn by day, by night and in almost any setting. Isn’t this what fashion is? Gucci’s nautical collection was designed with a sophisticated, but playful man in mind. With close attention to details, this red, white and blue outfit is one of our favorite looks from all the 2015 resort collections. The overall outfit has flair, it is crisp and it gives a sense of timeless elegance. The effortless aesthetic makes it one of the best nautical looks from the last seasons. Philipp Plein delivered an amazing collection that featured bold looks and a dynamic aesthetic. This look is our favorite from the collection, as they made great use of a leather diamond quilted top by pairing it with a pair of short jean. Both pieces feature a strong aesthetic and make each other stand out. This look goes to show how you can make your jeans look great by mixing them with a powerful, interesting top, such as a leather jacket. The bold shoes and the big backpack complete the outfit and make it the perfect look for a summer day. Armani suggested a collection that reinterpreted the military look by taking it to the next level of style. With a knitted top and a pair or neutral gray pants, this outfit can teach any man a few valuable fashion lessons. First of all, one can notice how an all-neutral outfit (all the colors of this outfit are neutrals) can look great if the pieces fit correctly. And secondly, notice how, by putting on a great pair of sunglasses, the whole outfit is put in the limelight. Adding accessories to an outfit is a very sophisticated, practical and easy way to style up an outfit! Channeling a sophisticated feel, the Boss 2015 resort collection featured many suits and tuxedos. Even though most looks were great, we especially liked the outfit above; as it showed that you can be conservative and quite formal, but youthful and summer-y at the same time. By adding a stripe shirt to a solid jacket and a checkered pocket square as well as a boutonnière, any outfit can be updated and modernized in no time. Always remember that if you wish to mix patterns, they should be of different sizes and that if you want to wear both a tie and a pocket square at the same time, they should not match both in fabric and color or patterns, as the goal is for them to complement each other. The Marc by Marc Jacobs looks drew attention as they mix sartorial elements from different eras and subcultures. From 1970s colors to the 1950s rugby aesthetic, everything seemed to be on the inspiration board when this collection was created. The styling is very Marc Jacobs as slim pants were paired with bold jackets and accessories, making these looks noticeable and outstanding by a mile. Diesel Black Gold’s creative director Andreas Melbostad presented a collection of looks that were inspired by the cutting-edge style of the early bikers. The slim-cut pants paired with bold shoes and a jacket that features accent lapels and pockets are complimented by a great belt that sets the tone of the outfit. The 2015 collections gave us a lot to see and a lot to wear. The nautical and the military aesthetic, which were so very present, are great aesthetics in which it is worth investing, as they never seem to go out of style. 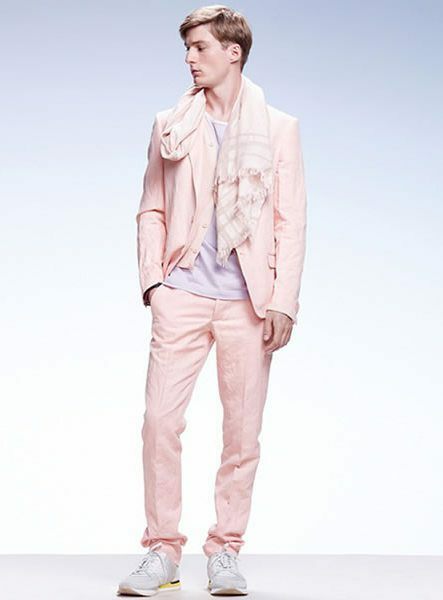 Therefore, the 2015 resort collections for men were definitely a win, so it’s up to the wearers now to make this season memorable. P.S. What did you think of these looks? Which one was your favorite? Share your feedback, questions or thoughts in the comments below! For more articles on style, fashion tips and cultural insights, you can subscribe to Attire Club via e-mail or follow us on Facebook or Twitter! The post The Best 7 Looks from the 2015 Resort Collections appeared first on Attire Club by Fraquoh and Franchomme | Men's Style, Fashion And Lifestyle.